Welcome to a series we hope to do more of here on Dads Drinking Bourbon, where we allow guests to let us know what is going on in their state. We know that we might not have access to all of the bourbon out there, but our buddy Dirk, better known to all of you on Instagram as bourbon317, takes us on a journey to what’s going on in his home state of Indiana. In today’s edition, he highlights Starlight Distillery. Check back as we hope to have more updates from Dirk in the future! Make sure to check out his Instagram as he works to promote the great bourbon in Indiana! Hope you enjoy and thanks again Dirk! It’s great to have great people like you adding to all the good information here. 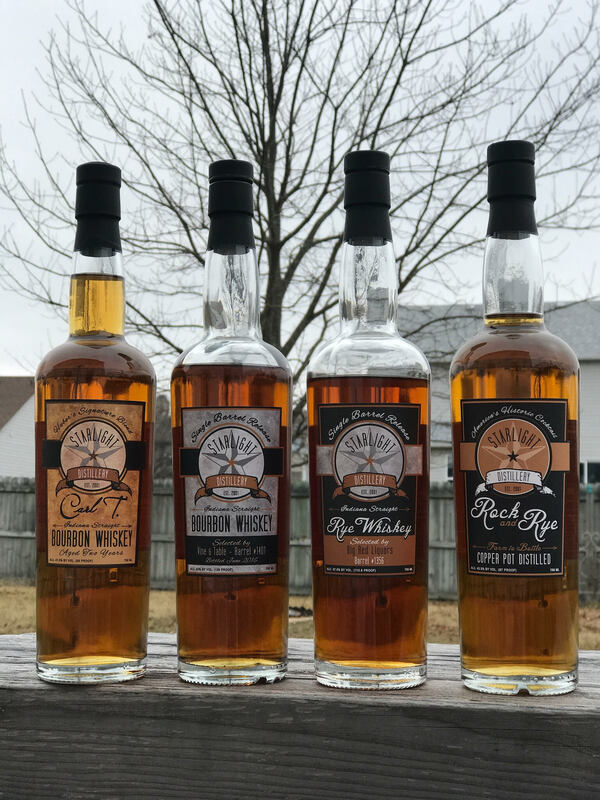 When Subourbon Dad asked if I could write a little something about bourbon in Indiana I knew right away I wanted to highlight one of the best up and coming distilleries in the country in my opinion, Starlight Distillery in Borden, Indiana. There most widely distributed release Carl T. Bourbon Whiskey is a daily drinker for me. Finish: Not long but not short either, pretty mild as the vanilla and caramel linger and you can really taste the flavors and the fruits of the orchard and farm this bourbon comes from. It tastes like Indiana in the Fall in your mouth! “Starlight Distillery’s Carl T Bourbon is now available! Appropriately named after the Grandfather of 6th generation co-owners Greg & Ted Huber, the Huber’s felt it only fitting to title this signature blend after their 4th generation grandfather “Carl T” who had a love for bourbon. I know the age statement of two years may scare off a few bourbon enthusiasts but I’m telling you they have made a great bourbon here and nothing white dog/moonshine to it for its young age. In addition to the Carl T. label, they also have limited releases of Single Barrel Bourbon MSRP $49.99 (108 Proof), Single Barrel Rye MSRP $49.99 (115.8 Proof), and Rock and Rye MSRP $29.99 (87 Proof)! If it’s any indication of how good I think it is I asked my wife for four bottles of their Single Barrel Bourbon for Christmas. (And she delivered)! You can find these for sale at their distillery (which also offers tours) and local stores that do store pick single barrels such as Big Red Liquors and Vine and Table. Carl T. – BUY IT! Single Barrel Bourbon – HUNT IT! Single Barrel Rye – HUNT IT!